Hot off the heels of their recent production of A Chorus Line, Kinetic Theatre Arts proudly presents Legally Blonde. 2017 is already shaping up to be another busy year for one of Cardiff’s most industrious theatre companies. Kicking off the year with rehearsals and preparation for their spring / summer productions; Legally Blonde, Seussical the Musical & RENT – for their Musical Theatre Company, Youth Academy & Senior Company (respectively) as the Theatre School students prepare for their Musical Theatre LAMDA exams & then Peter Pan as their summer production. 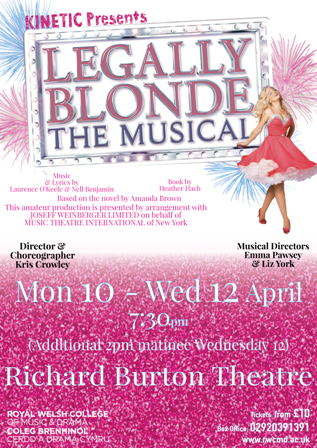 This Easter holidays we kick start the juggarnaught of productions with Legally Blonde. It tells the story of Elle Woods, a sorority girl who enrols at Harvard Law School to win back her ex-boyfriend Warner (who has dumped her for a career in law, with a “serious” girlfriend to accompany him) She discovers how her knowledge of the law can help others, and successfully defends exercise queen Brooke Wyndham in a murder trial. Throughout the show, no one has faith in Elle, but she manages to surprise them when she defies expectations & demonstrates staying true to yourself never goes out of style! Perfect for the Holidays!